Mindfulness is something we all naturally possess. It can be easy to rush through life without stopping to notice much. Paying more attention to the present moment – to your own thoughts and feelings, and to the world around you – can improve your mental wellbeing. But can the same be said about your place of work? 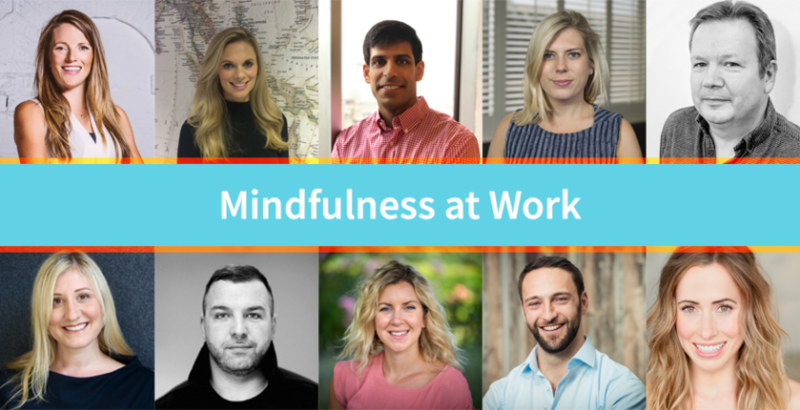 With more and more companies incorporating mindfulness in their employee wellness programs, our 10 corporate wellness experts explain why it is important to consider. Mental health is becoming an increasingly important part of employee wellness programs, and mindfulness training is one of the tools employers are using to help employees improve their mental well-being. In addition to being an effective tool for mental health, mindfulness has other benefits that is increasing its importance to employers. For example, it is free to practice, helps employees accept things they cannot change, and can be done anywhere. balance – can result in positive behavior changes that enhance and prolong mental wellbeing. Long-term, it might help prevent further aggravation of stress, difficulty coping, or mental ill-health for employees. Here’s a sobering stat: According to the American Institute of Stress, 80% of workers feel stressed on the job. Nearly 50% say they need help in learning how to manage stress, while 42% of people say their coworkers need such help. Dealing with stress isn’t just a minor annoyance; it can lead to serious health and performance issues, including frequent headaches, irritability, insomnia, difficulty making decisions, and trouble remembering. Not exactly the formula for a healthy, productive workplace. Unless you’ve been living under a rock, chances are you’ve heard about the benefits of meditation—including reduced blood pressure, less stress and anxiety, lengthened attention spans, and improved sleep. Whether you offer meditation sessions, yoga classes, or mindfulness workshops, any element of mindfulness can go a long way in improving employees’ health and well-being at work. There are mixed views on mindfulness in the workplace and mindfulness as a practice, which doesn’t mean it’s a right or a wrong practice to introduce into your wellness strategy. In fact, there is a large amount of research showing only positive results when mindfulness is a key part of a wellness strategy. There is definitely a valid benefit to your workforce in practising mindfulness, however, I think that you need to also be aware that not everyone is completely ready to embrace these practices just yet. Having a mindfulness partner/provider/solution as part of your strategy means you can promote it as a self-serve option. This gives those that are interested a great benefit, creating champions or advocates that can help promote it to the rest of the business. The pace of modern living is incredibly fast and today’s “always on” culture can lead to employee burnout. Mindfulness is the ancient practice of being in the moment to reduce stress and encourage self-awareness and clear thinking. Incorporating mindfulness training into your wellbeing programme can improve efficiency, resilience and better communication. In collaboration with Mindlab, Nuffield Health deliver bespoke mindfulness workshops, including ‘lunch and learns’ and themed days, as well as foundational training courses in the practice. Sessions can be delivered live, either face-to-face or via webinars to increase accessibility. Work life integration is key – it’s not about trying to split one or the other but being in a job/ company you love that matches your values and respects the little or regular time you do wish to be away. Mindfulness is becoming more popular in the world of employee wellness. Many employers are now embracing mental resilience and mindfulness education as a part of their workplace wellness programs. With 84% of employees experiencing physical, psychological or behavioural symptoms of poor mental health, it’s essential we open up, talk more and break the stigma of mental health issues in the workplace. Expect to see more employers promoting the use of mental health initiatives and aiding therapy or counselling services and encouraging employees to practice self-care. Lastly, always try to get enough sleep (7-9 hours a night is recommended). The benefits are immeasurable and affects all areas of physical and mental health and wellbeing. Nearly 6 out of 10 of UK adults feel work is a common cause of stress according to recent research we conducted. In most instances it’s because we don’t know how to switch off from work, reflect on our state and just relax. We live complex lives, phrases like ‘spinning too many plates’ are now familiar language at work. We are finding it more and more difficult to concentrate and as a result may increase our stress. Mindfulness is the practice of purposely focusing attention on the present moment. The practice has been found to be a key element reducing stress and enhancing overall wellbeing. Being mindful makes it easier to become fully engaged in activities and creates a greater capacity to deal with the challenges of organisational life. Mindfulness is simply being in the present, so in the workplace, it means not being continually distracted and pulled away from what you’re working on. It’s spotting when you do become distracted and making a conscious decision around that distraction. I.e. I’ve noticed 9 new Whatsapp messages come through from my holiday group, but I’m working on this task at the moment and I’m going to choose to continue doing so. I’ll then reward myself by looking at the messages, when I’m done. From the moment we open our eyes it’s all go! Little surprise therefore that for many us the thought of taking time out at work to be mindful is difficult to visualise. However, allowing your people time every day to relax, be still and show gratitude is as important as encouraging them to be active and eat well. Not only does it re-energize them, it also helps your people focus, compartmentalize and prioritise, all of which are useful skills in their own right. In addition, it can help reduce emotional exhaustion and increase job satisfaction which is good for everyone. Thousands of studies have shown that mindfulness training reduces stress, anxiety and depression while improving the immune system and the cognitive skills that are key to high performance. We all know that work can be stressful. This stress can negatively impact employee engagement, retention, and productivity. Virgin Pulse State of the Industry report revealed that 98% of companies believe that workplace and personal stress adversely affect employee engagement. Many of us have felt this impact in our own lives; when we feel overwhelmed or spread too thin, our energy levels decrease and our immune system becomes compromised. Stress can literally make us sick, and when we’re sick or overwhelmed we can’t properly engage. Businesses that prioritise mindfulness training can mitigate these effects by helping their employees learn how to focus the mind and relax the central nervous system to better handle stress.